This style guide aims to help you make sure your vintage jewellery always looks its best. We encourage you to get started wearing your beautiful heirlooms together with your modern fashionable jewellery. It's not that difficult, all you need is to find your vintage pieces and try styling them with new pieces. Layering your vintage and modern necklaces is the perfect way to opt for a chic and fashionable jewellery look. Wearing a classic gold collier with modern style chokers gives an eye-catching layering effect and a super stylish look. 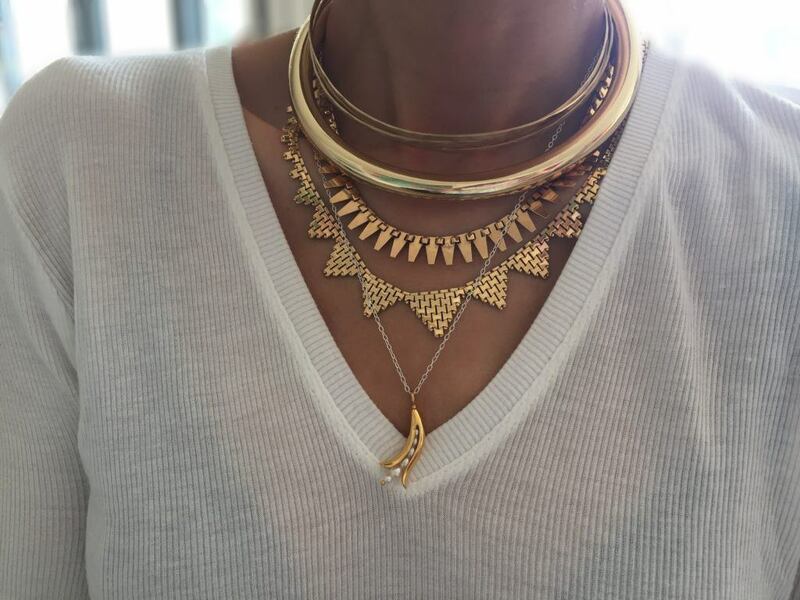 To create a personal and characteristic look the best styling tip is to combine different types of necklaces, such as chokers worn together with pendant necklaces. We also encourage you to wear gold together with silver as it ads another dimension to the stacking game. Modern, Pilgrim gold vermeil chokers, Modern, Maria Nilsdotter silver necklace with banana pendant, and vintage gold necklaces from Bruun Rasmussen Auctioneers. We’re into the mix and huge fans of mixing vintage and modern jewellery. 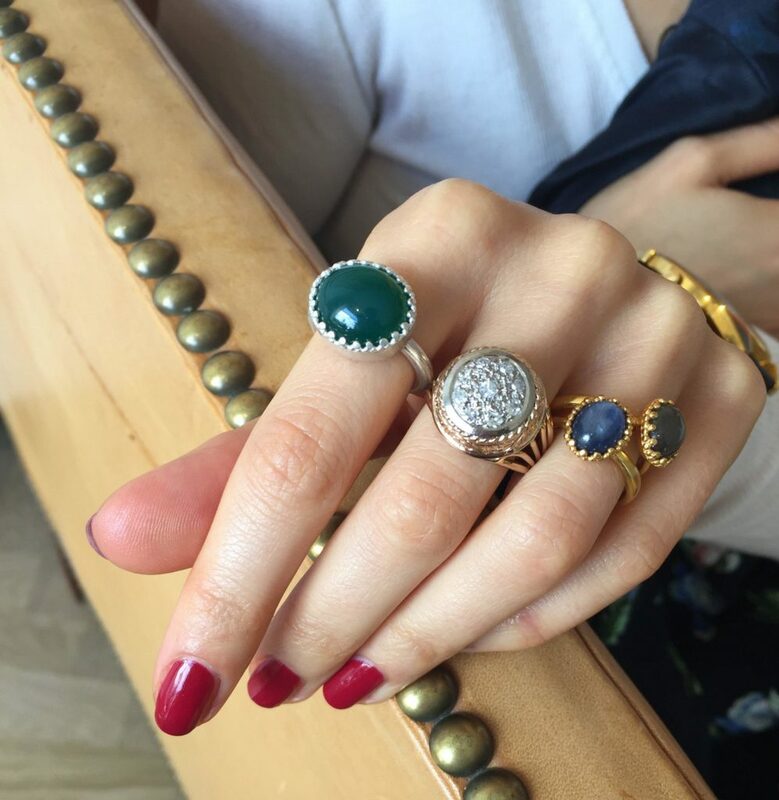 A handful is just enough to create that right statement look of vintage rings and new rings. Wearing a vintage diamond ring always ads exclusivity to the selection, a hint of sparkle always adds an elegant finish. When it stands alone the look can feel to feminine or old school, yet worn with newer rings the diamond vintage ring ads sophistication and character to the styling. The combination of vintage jewellery and modern jewellery worn together creates a distinctive and super stylish look. It ads character and personality to your outfit. Don’t be afraid to wear new and old rings in a fashionable “chaos” look. First, you need to dive into your jewellery box to find those beautiful hierlooms from the flea market or from your grandmothers jewellery box. They might be harnished or seem too old, but don’t worry. Usually you can fix them up easily with simple jewellery care routines. If you don’t already have vintage jewellery in your jewellery collection we know excatly where you can get them. Our favourite place to find just the right vintage jewellery is online at Bruun Rasmussen Auctioneers where you will always find a beautiful range of vintage jewellery at fair prices. All pieces have been viewed by professionals.